Let’s Get Cooking with the HandmadeMN Etsy Team! Celebrity chefs are the new rock stars. Ina Garten, Bobby Flay and Giada De Laurentiis draw huge television ratings, inspiring us to cook exciting new dishes in the comfort of our own homes. With a little help from our HandmadeMN makers and artisans, you too can take part in the cooking-at-home trend. Before you start preparing your all-star meal, put on a reversible apron from BethieAnnDesigns. Functional and pretty, this apron will keep you clean in style. 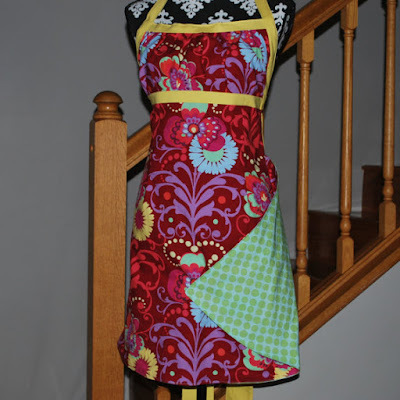 This beautiful apron is reversible, and will add colorful flair to your kitchen endeavors. 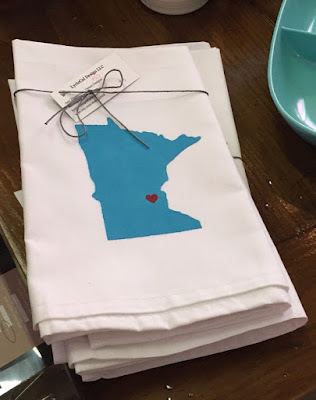 A Minnesota-themed towel by lyriccol will add fun and cheer to your kitchen prep. 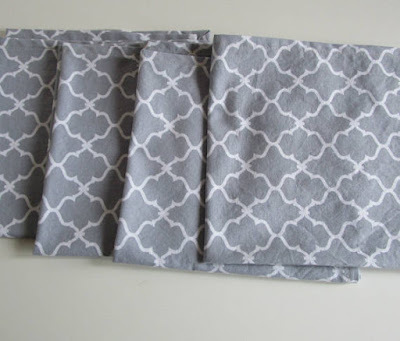 These cotton towels are made with non-toxic fabric paint, and also make a great hostess gift. You can now show your state pride in the kitchen! 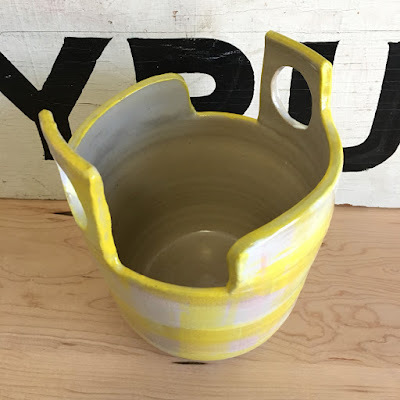 You’ll be honored to present your kitchen creations in this wood-fired, large striped serving bowl by suepariseaupottery. 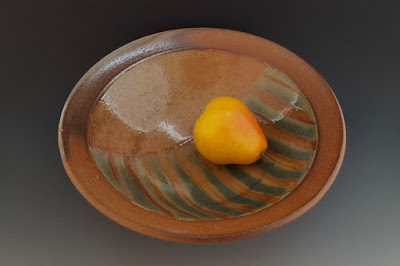 Featuring non-toxic glazes, this piece will also serve as a lovely art piece in your kitchen and dining room for many years to come. Enjoy this gorgeous bowl today, and leave a well-loved heirloom for the next generation, too. Even gourmet chefs have a few time-saving, tasty tricks up their sleeves. 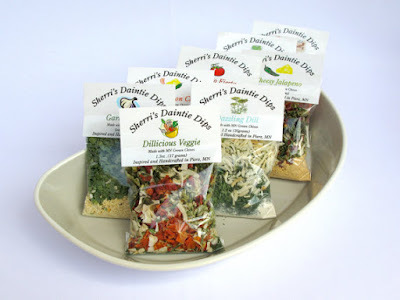 When you need a savory treat in a pinch, try a dip mix by SherriLynnsinPierz. With 8 flavor options, you’ll always have something new for your guests to try. Which flavor will you try first? Or will you mix 2 to make your own custom combo? After all that work in the kitchen, you’ll also need to clean up. 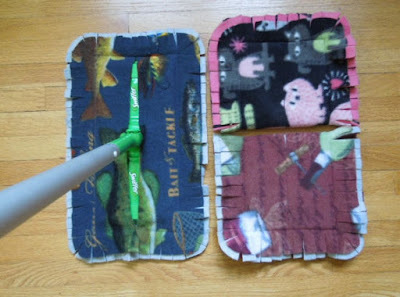 Fortunately, clean up can be a lot more simple with this set of three floor cleaner covers by Pinnetta. These covers will save you time and money, and they’re also a great eco-minded choice. With this fun clean-up option, the kids may want to get involved, too! Thank you to these skilled HandmadeMN makers for their functional and beautiful wares, and for inspiring us to finally try that new recipe we saw on TV. 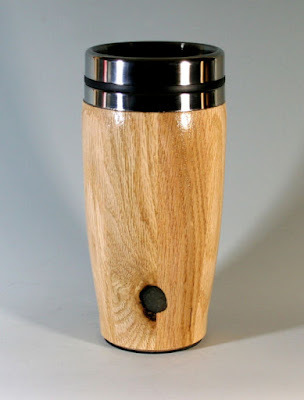 Be sure to check out the many Etsy shops of HandmadeMN for even more fantastic ways to get cooking at home. We love to share stories about local Etsy artisans and the local shops who sell their work. HandmadeMN member Sara Werzel has her Auntie B's Wax products in The Farmer's Daughter shop in White Bear Lake. Recently the White Bear Lake Magazine did an article featuring their relationship and Sara wrote about it in her blog. Here is a link to Sara's blog with the article. With Earth Day approaching on Saturday, April 22nd, it is time to showcase our makers who use recycled materials in their work. Recycled Fabric rescued from an Interior Designer studio before it hit the trash bin. Naturally Unique Rock is saving Earth's fresh water--one cube at a time. 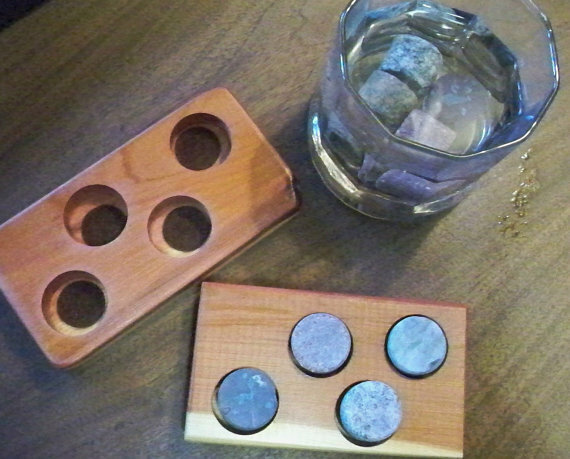 These Whisky Rocks are cut from waste granite from a countertop supplier in the St. Cloud area. Would you believe this is made with strips of recycled blue plastic bags? 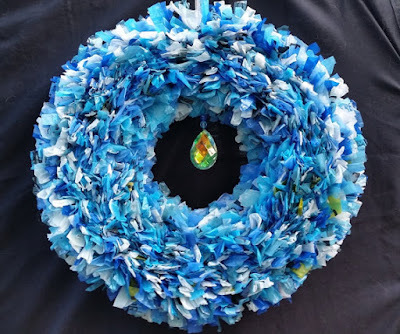 Susie B Handicraft crafted this all-season wreath. Think of all the bags saved from the landfill with this! 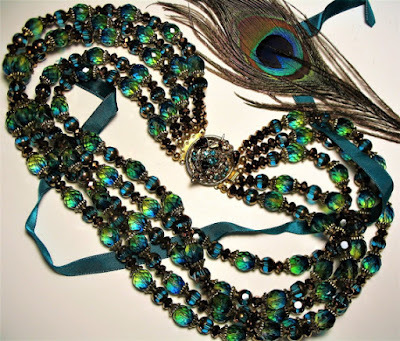 Gemnorde created this WaterSky statement necklace, taking it's inspiration from the Earth, is made of 90% recycled vintage beads, rhinestones and jewelry findings. Regan's Brain says this pillow fabric is made from recycled plastic bottles! What a great decor statement piece. This reusable travel mug replaces paper cups and plastic bottles. It's also constructed out of recycled oak by Just Turned. It's a win win. 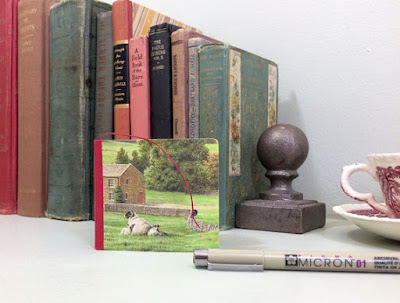 These mini journals by Sharon's Compedium are made with a mix of upcycled and recycled materials. They're so tiny because the strips of paper are from other projects and the covers are from packaging. This one is made from a box of Yorkshire tea. 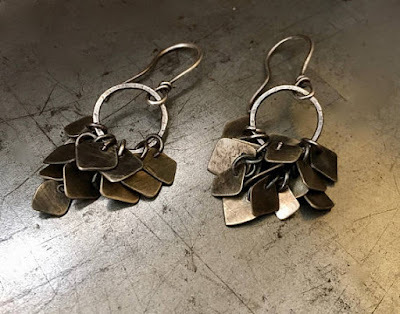 From scraps to scrumptious, these tiny metal dangles have been recycled into swinging earrings. Ejoy from Metaling Susie! 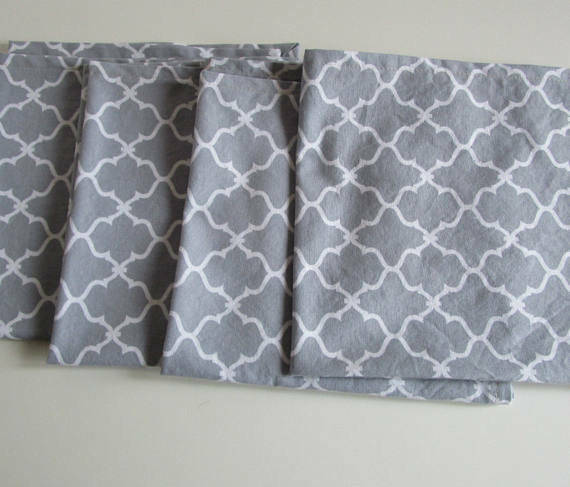 Cloth napkins are reusable and limit paper waste in your kitchen. 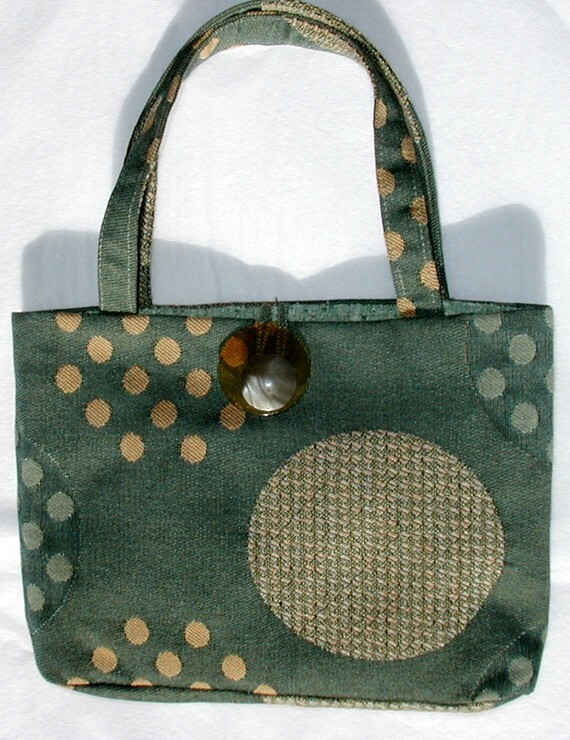 Shaggy Baggy offers a variety of styles in her Etsy shop. How will you reduce, reuse and recycle this Earth Day? Easter is both an ancient festival of spring and nature's awakening, and a deeply religious celebration for Christians, marking the resurrection of Christ. Hello! 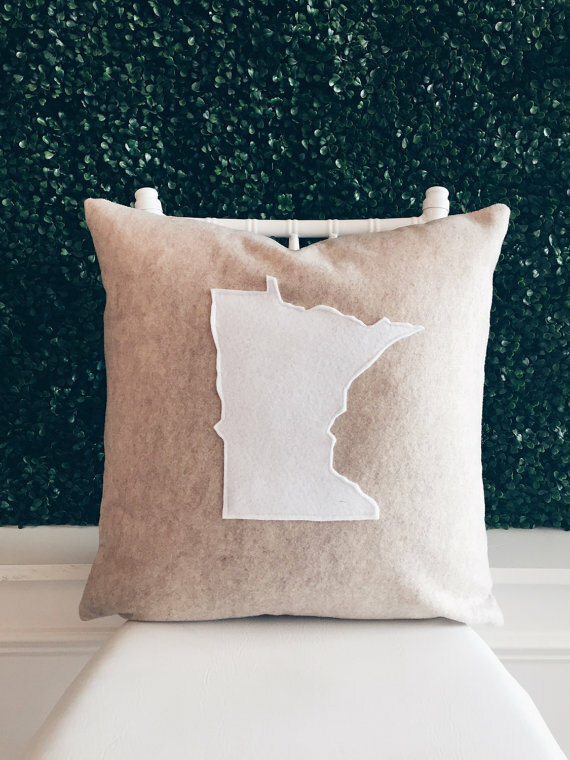 Before we go too far astray on a sugar reverie, let's consider these excellent handmade-in-Minnesota items for gifting and celebrating in all those many ways. For religious observants, surely the most important symbol of the occasion is the empty cross. 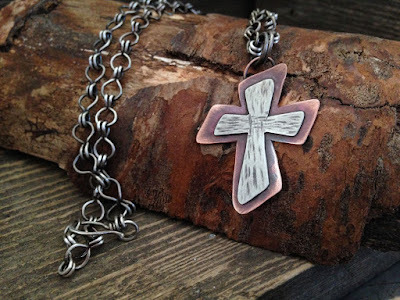 From Metaling Susie, this rustic cross is suitable for men, women, girls or boys. 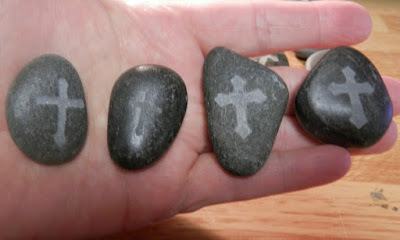 This small pocket cross is sandblasted on Lake Superior stone by Naturally Unique Rock. 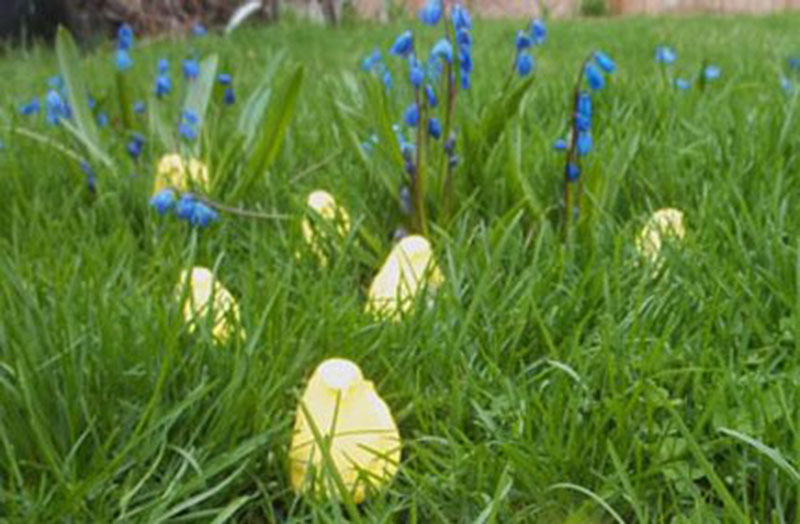 It comes in a set of two and is perfect for Easter, confirmation, or other religious milestones. Also symbolic of the resurrection is the Easter lily. 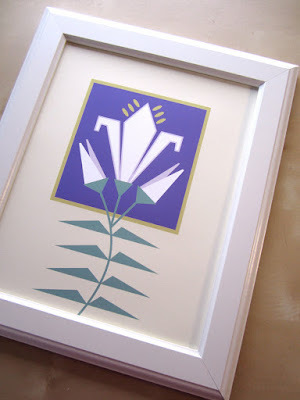 Here's an elegant stylized version by Cindy Lindgren. 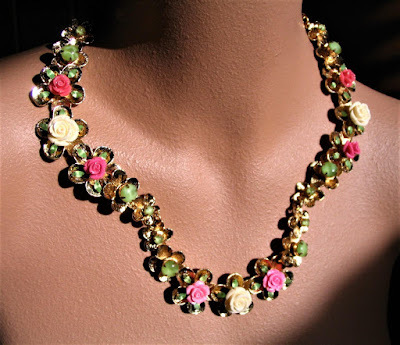 Gayle Thorsen of Gemnorde suggests that you forget about an Easter bonnet and instead don this delicate necklace-wreath of pink, rose, and cream flowers, with spring green rhinestones. It's made of 80 percent vintage findings and is truly one of a kind. And let's not forget about the bunnies! Little Wooden Wonders has a few different bunny toys and puzzles along with baby chick toys. 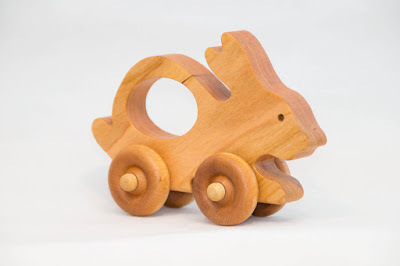 Like this wooden bunny toy car. 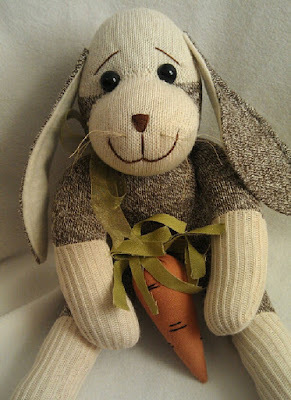 While Sock Monkey Angel offers this adorable Peter Rabbit Sock Bunny; sure to bring a smile to anyone's face. 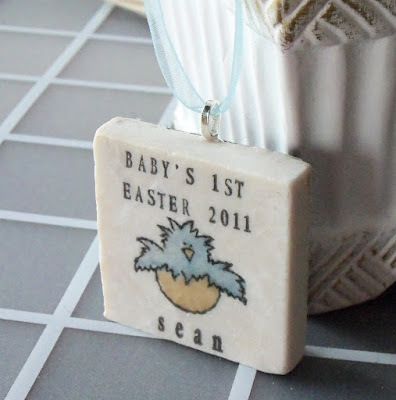 My Little Chickadee offers personalized commemorative Easter ornaments, in both pink and blue color schemes.